88-Note MIDI keyboard with the feel of a full-range piano. 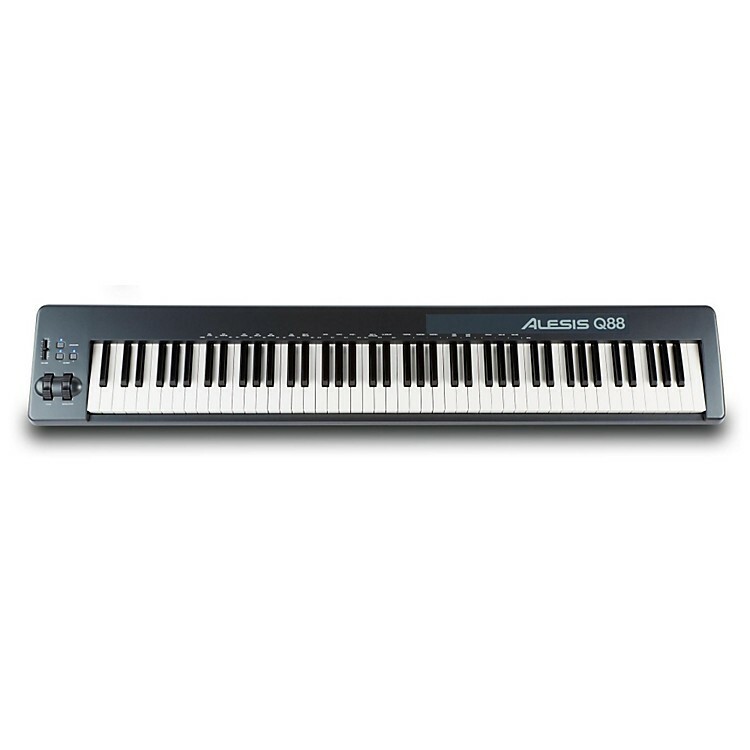 The Alesis Q88 is an 88-note MIDI keyboard that has the extended range of a full-size piano. Equipped with 88 semi-weighted, velocity-sensitive keys, the Q88 provides an excellent feel that conveys all the nuances of your playing. Pitch bend and modulation wheels ensure an expressive performance, plus you can transpose quickly to play in any key. At just 22lb, the compact and portable Q88 is equally at home on stage and in the studio. The Q-series USB/MIDI controllers from Alesis are the no-nonsense way to add expressive MIDI control to your production and performance. Each controller features USB-MIDI for easy connection to Mac, PC, iOS devices*, and a traditional MIDI jack for connecting to MIDI sound modules, synthesizers, samplers, and more. The Q88 works with virtually any music software and MIDI hardware devices. Providing the full piano complement of 88 keys, The Q88 is a sleek controller, at home on stage or in the studio. A full array of essential controls is onboard, including pitch and modulation wheels, octave up and down buttons, and an assignable data slider. The Q88 is the perfect choice for controlling hardware MIDI devices. Compact and portable, the Q88 is the ideal foundation for your road ready rig. The Q88 offers a streamlined layout to maximize your sound and performance options. You can even send Program Changes from the Q88's keys to change programs, patches, and more. The Q88 comes with Ableton Live Lite Alesis Edition software so you can perform, record and sequence music right out of the box. This customized version of Ableton Live provides a fresh and easy way to create music. You'll get audio recording and production capabilities as well as powerful tools for live performance. Have the feel of a full-size piano in your studio.